OK, I know last time I said we’d be getting onto Islamic theology with this one, but that’s coming next time. Instead, let’s talk about what’s going on in North Africa and Spain in the period through 909 (in Africa) and 912 (in Spain), because if we don’t do it now we’ll never do it. I already talked about the Aghlabids in Ifriqiya (more or less modern Tunisia) in the last entry, because they, unlike some of the other ruling groups we’ll be talking about here, still paid at least a nominal allegiance to the caliph in Baghdad. But in terms of their geographic location and their activities, they really belong in this discussion. The dynasty formed out of the Arab armies sent to put down the many Berber rebellions that took place in North Africa in the mid-8th century. The dynasty’s founder was Ibrahim b. al-Aghlab, the son of al-Aghlab b. Salim, who was the governor of Ifriqiyah in the 760s and died putting down another rebellion, this time among the Arab army stationed there, in 768. Nominally governors of the entirety of North Africa west of Egypt, in actuality the Aghlabids ruled a territory that extended from Tripolitania (western Libya) in the east to the eastern part of Algeria in the west. The Aghlabids were basically on their own despite paying that nominal allegiance to the Abbasid caliphs, and they spent a lot of time managing relations between their Berber and Arab troops, either of whom was a threat to rebel if its grievances piled up high enough. In fact the Arab army was the more frequent problem, which the Aghlabids would usually solve by allying themselves with the Berbers. Still, Berber resentment was high, because they were comparatively poorly treated compared to the Arabs; the only reason they supported the Aghlabids so often is that they figured whatever Arab government might replace them would only be worse. The Aghlabids conquered Sicily, a long process that began in 827 and didn’t end until 902 (which was great as far as the Aghlabids were concerned, because fighting in Sicily gave the Arab army something to do besides revolting); the island would remain under Muslim control until the Normans arrived in 1061. Under their stewardship, the city of Qayrawan (about 100 miles south of modern Tunis) became one of the great cities of the empire, though referring to the whole thing as one “empire” at this point may be pushing it. Under Ibrahim II (d. 902), the dynasty began to really take a despotic and oppressive turn, executing several leaders of the still-rebellious army and shutting the rest of the Arab aristocracy out of the upper levels of power. The discontent this engendered among the Arabs (remember, the Berbers are already seriously disenchanted) left the ground open for a competing ideology to challenge the Aghlabids, and when Shiʿa missionaries (of the Ismaʿili branch, not the Imami branch practiced in Iran today; we’ll talk about the difference soon) made their way to Ifriqiyah they found a welcome reception. In 899 the Berber Kutama confederation pledged itself to an Ismaʿili imam named Abu Muhammad Abdullah “al-Mahdi bi’llah,” and by 909 they had swept the Aghlabids aside and proclaimed their own Shiʿa caliphate, the Fatimid Caliphate. We’ll cover them in detail later. As you move west, caliphal control becomes even more tenuous and then disappears, mostly as a consequence of those Berber rebellions. In modern Algeria, several Ibadi Kharijite Berber tribes migrated into the region in the mid 700s and openly resisted Abbasid efforts to project authority there while also feuding amongst themselves. However, in 777 they all sort of coalesced around the imamate of Abd al-Rahman b. Rustam (d. 788), an ethnic Iranian who was born in Ifriqiyah. More Kharijite Berber tribes (Kharijism was popular among the Berbers for its explicit rejection of ethnicity as a basis for political or religious authority), who rejected the Abbasid caliphs, migrated into the region and joined the Rustamid confederation. Ibn Rustam and his successors were able to float above the sometimes nasty inter-tribal spats that broke out among their followers, and despite the fact that Kharijites are supposed to reject hereditary rule, the confederation’s religious leaders kept deciding that Ibn Rustam’s male descendents just happened to have the right stuff to be imam, which was a really neat coincidence. The Rustamids tolerated plenty of non-Kharijites living in their territory and also basically agreed to live and let live with the neighboring Sunni Aghlabids, which for a Kharijite principality shouldn’t really have been an option. But the Ibadis were probably the most moderate branch of the Kharijites, and over time they moderated still further. They dropped the belief that sinners should be treated as apostates and killed, opting to shun them instead. Today Ibadiyah is the dominant form of Islam in Oman, which is a pretty moderate, tolerant place in comparison to some of its Sunni and Shiʿa neighbors. The Rustamids spent most of their energy just trying to maintain cohesion in the Berber confederation, which was achieved mostly be making repeated compromises in their Ibadi ideology (in order to justify continued Rustamid rule, which was the only thing all the Berber tribes could agree on). Eventually, though, the Ibadi ideology became so compromised that it lost its ability to knit the Berber tribes together, and when the Fatimids showed up from Ifriqiyah in 909 they had a pretty easy time conquering the region. Still further west, in modern Morocco, the situation was equally out of Baghdad’s hands. A man named Idris b. Abdullah (d. 791), who traced his ancestry to Ali and Fatima, escaped the Battle of Fakhkh (near Mecca), where in 786 the Abbasids suppressed an Alid uprising under Husayn b. Ali. He wound up in Tangier, then in the northern city of Volubilis, where he became the religious leader (imam) to the Awraba Berbers of the area, who probably saw the patronage of a descendent of Muhammad as a big political score for them in their rivalry with the other Berber tribes of the region. Idris tried to make himself the political leader of the Awraba as well as their spiritual leader, and his son, Idris II (d. 828), invited Arab migrants to the region who helped him counterbalance the indigenous Awraba leadership. He developed a new capital at Fez, and when he died the Idrisids were the unchecked power in the region. He left his empire to be divided up among his 8 sons, nominally under the lordship of his son Muhammad (d. 836), but the division inevitably weakened the dynasty and allowed the Berbers to again assert their power. The Idrisids practiced another form of Shiʿism known as Zaydiyah, who branched off from the rest of the Shiʿa when they followed Zayd b. Ali, one grandson of Husayn, instead of his half-brother Muhammad al-Baqir, who was followed by the groups who would become the Imami and Ismaʿili Shiʿa. We’ll talk about the various Shiʿa branches in more detail later, but Zaydis differ from the other two main branches in that they believe that any descendent of Ali and Fatimah, whether via their older son Hasan or Husayn, is eligible for the imamate, whereas the two larger Shiʿa branches only believe that Husayn’s descendents are (or were) eligible to lead the community. The Idrisids did their best to spread a more orthodox (albeit Shiʿa) form of Islam, as well as Arabic culture, throughout the area they conquered, but while they had success in towns and cities they were really unable to penetrate the Berber culture of the hinterlands. The Berber languages continued to predominate and forms of Islam mixed with traditional Berber tribal religions sprang up. They were hard pressed by the Miknasa Berbers, who were Fatimid vassals, in the 910s and 920s, but they managed to hang on to some territory until 985 when they were wiped out by the Umayyads in Spain. There were other small principalities in the same far western region. Further south, a Kharijite tribe called the Banu Midrar (after its founder, a Berber chief nicknamed “Midrar”), driven west by the Rustamids (they were Sufrite Kharijites, not Ibadis), established one such entity around an oasis, before founding the city of Sijilmasa as their capital. They were in a prime position to control the trans-Saharan trade to and from the Niger river area, a route that facilitated the spread of Islam into that region. They also survived the Fatimids but were done in by the Umayyads in the latter half of the 10th century, though their kingdom was revived under the Maghrawa Berbers, who declared their independence from the Umayyads and remained in power until the Almoravids conquered the area in 1055. The Kingdom of Nekor, on the Mediterranean coast, was founded by a Yemeni, Salih I b. Mansur al-Himyari, in 710 on the basis of a caliphal land grant, and managed to survive until 1019. 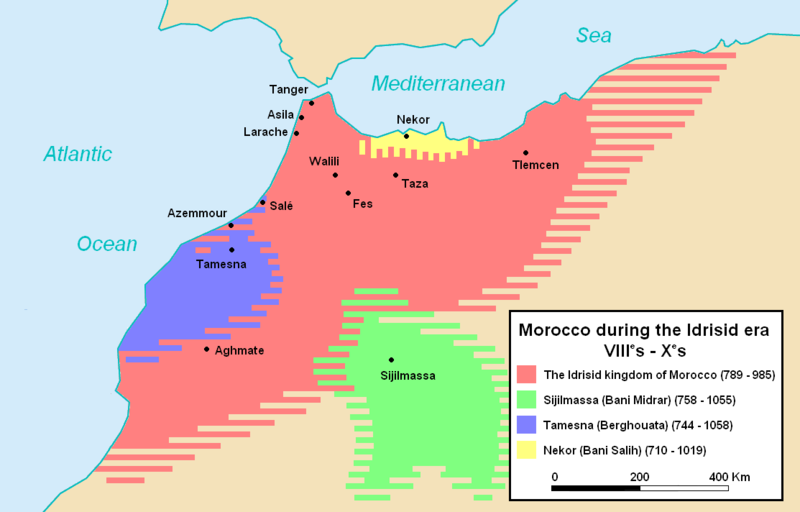 On the Atlantic coast, the Barghawata confederation (one of the leading groups behind the 740 rebellion) established a small kingdom in the Tamesna (Berber for “plain” region that they held from 744-1058, when they were defeated (but not totally eliminated) by the Almoravids. Not very much is known about them, but they seem to have dropped their Khariji ideology and adopted a faith that was a mishmash of various forms of Islam and Judaism with traditional Berber beliefs. Now, Iberia. Last time we talked about Iberia, the Umayyads had conquered the peninsula and reached their furthest extent before being driven out of France by Charles Martel and later Pepin the Short. Al-Andalus now transitioned from an Umayyad province to the last place on the planet where the Umayyads remained in power, because following the Abbasid takeover a 20 year old cousin of the Umayyad caliph, Abd al-Rahman b. Muʿawiyah, fled Damascus as far and as fast as he could go. He was almost captured in Ifriqiyah by the Fihrid governor there (the Fihrids were the most prominent Arab family in North Africa and Iberia while the Umayyads were in power, and had founded Qayrawan), Abd al-Rahman b. Habib. Ibn Habib invited all the surviving Umayyad princes to Ifriqiyah under his protection, before thinking the better of it when their arrival made the Fihrids the second most prominent Arab family in North Africa and Iberia. Abd al-Rahman b. Muʿawiyah managed to escape Ibn Habib’s change of heart and made it all the way to Iberia, while the Fihrids, who had ironically used the 740 Berber revolt to cement their hold on power, were toppled by another Berber revolt in 758, which paved the way for the Aghlabids to assume control. When he crossed the straits to Iberia in late 755, Abd al-Rahman found Andalus in chaos, with Arabs and Berbers fighting each other, new Arab arrivals feuding with the Arabs who were already there (the old Qays/Yaman rivalry again), and the Fihrid governor (Yusuf ibn Abd al-Rahman al-Fihri) warring with his vizier. Abd al-Rahman managed to gain the support of both Syrian contingents who still had loyalty to the Umayyad name and Yemeni contingents who were just tired of the weak al-Fihri, and Abd al-Rahman’s army met the Fihrid army outside Cordoba in 756. After reassuring soldiers who were worried about his lack of battlefield experience (even trading his horse for a mule to convince the men that he had no plans to run from the battle), Abd al-Rahman led his army to victory, took Cordoba, and imprisoned al-Fihri within the city. Abd al-Rahman was proclaimed Emir (not Caliph, that would have been too much) of Cordoba in May 756, but between Fihrid holdouts and agents of the Abbasids it took until 781 to firmly establish Umayyad rule over all of Muslim Iberia. To the surprise of no reader, if you’ve been paying attention, the succession to Abd al-Rahman, who died in 788, was a train wreck. Abd al-Rahman’s middle son, Hisham, succeeded his father, but his older brother, Sulayman, raised an army and the civil war was on. It was mercifully short, though, and Hisham was free to focus on subduing periodic rebellions in other cities as well as defending Muslim holdings on the peninsula from Christian expeditions out of the north. Hisham died in 796, and his son and successor, al-Hakam, immediately had to deal with his uncle Sulayman and his other uncle, Abdullah, who returned from exile in North Africa to challenge the new emir. Sulayman failed and was executed, but Abdullah took control of Valencia, which hadn’t been under Umayyad control previously, and managed to cut a deal with al-Hakam that left him in power there. The rest of al-Hakam’s reign was mostly spent viciously suppressing rebellions in his own capital of Cordoba. Abd al-Rahman II succeeded his father al-Hakam and reigned 822-852. That lengthy rein allowed him finally to establish a stable kingdom with a formal royal court and administrative bureaucracy. He patronized great artistic and literary culture in his court and massive building projects all over Cordoba, seeking to turn his capital into a grand city to rival Baghdad. Militarily his greatest crisis was a Viking sack of the city of Seville in 844; the rapid and devastating response of the Muslim military apparatus to the Viking assault illustrates how far the Umayyads had come in establishing a functional kingdom where there was once chaos. Christian armies were able to make some gains on the frontier, capturing Barcelona in 801 for example, but nothing that seriously threatened the kingdom. Still, the only thing holding the disparate and mutually hostile elements of the Umayyad emirate together was the emir’s strength of will, and when Abd al-Rahman II was succeeded by a weaker emir (his son Muhammad), things went south in a hurry. Muhammad had the misfortune of taking over just as large numbers of Andalusian Christians started converting to Islam (research into biographical dictionaries and tax records suggests that anywhere from 50 to 70 percent of the region was Muslim by the end of the 9th century or thereabouts). The new converts, known as muwallads (a term usually used to describe the child of a Muslim father and a non-Muslim mother, but here signifying the children of converts who were not originally Muslim themselves) began to compete with the feuding Arabs and Berbers for power and influence, but they also, by virtue of having converted, stopped paying the extra jizyah poll tax that was levied on non-Muslims. So not only was the emirate destabilized by the addition of new internal rivalries, it had to deal with the loss of considerable tax revenue. Muhammad was not strong enough to hold his kingdom together despite these challenges, and several cities began to assert local authority under their governors (unrest in Cordoba also bubbled back to the surface). 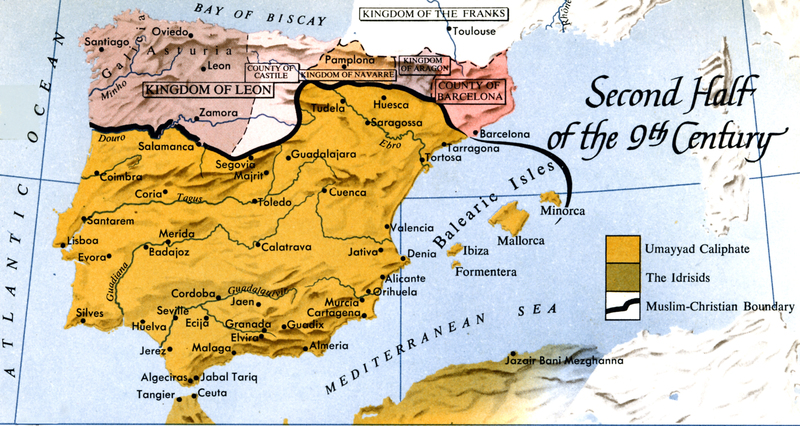 These local rulers would sometimes make overtures to Christian rulers like Alfonso III, who controlled Leon, Galicia, and Asturias in the northern part of Iberia, but little ever came of such contacts. A muwallad from the city of Ronda, Umar b. Hafsun, revolted in 881 and would cause the emirate tremendous grief for years to come. Muhammad died in 886 and was succeeded by his son, the more capable al-Mundhir, but he died only 2 years later, maybe murdered by his brother Abdullah, who now succeeded him. Abdullah really brought the emirate to its lowest point. Withdrawn from the daily administration of the kingdom and more concerned with murdering his brothers (who were potential rivals for the throne), Abdullah was unable to stem the tide of decentralization. Ibn Hafsun’s continued survival encouraged other disaffected muwallads all over the emirate to revolt against Cordoba. This had the effect of a large-scale revolution, even if in actuality it was a collection of unrelated local revolts. Worse for the Umayyads, these muwallad revolts drew harsh responses not from Cordoba, but from local Arab commanders, which may have put down some of the revolts but only inflamed tensions between the two groups. Ibn Hafsun grew strong enough to attempt to capture Cordoba before the Umayyad army defeated him in the town of Poley in 891, but this didn’t end his rebellion. In 899 Ibn Hafsun declared that he had converted to Christianity, which goes to show that even smart rebels occasionally do dumb things; the declaration cost him more support internally than it won him externally, and allowed the Umayyads to recast the fight against him as a holy war. It was only through the effort of the Umayyad court that the emirate was able to hang together even nominally, basically by putting the army on permanent campaign and marching from place to place to at least make a show of Cordoban force. But for all practical purposes, Abdullah’s authority maybe covered Cordoba but that was about it. In northeastern Spain, the region of Zaragoza was in the process of being completely lost; it had been governed by the Qasi tribe, who rebelled against Cordoba in 884 but were forced out by the emir in favor of the Tujibi tribe in 886. The Tujibis wasted no time establishing their own autonomous kingdom and would break with Cordoba completely in 1018. When Abdullah died in 912, his emirate was a complete mess, but he smartly decided to bypass all four of his living sons and hand power off to his oldest grandson (son of Abdullah’s deceased oldest son, Muhammad), who became Abd al-Rahman III. He would not only undo the damage his grandfather had done, but he would bring the Emirate, and later Caliphate, of Cordoba to its pinnacle both culturally and politically. Again, if you want maximum detail on the various regional dynasties that crop up in this period The Cambridge History of Islam, or The New Cambridge History of Islam, or the regional Cambridge Histories (Iran, Egypt, Africa) are your best bets, but these are not fun reading. For North Africa, though Jamil M. Abun-Nasr’s A History of the Maghrib in the Islamic Period is an excellent summary, though he spends a lot more time on modern history than on these early periods. Hugh Kennedy’s Muslim Spain and Portugal is my usual go-to on the history of al-Andalus.